Hearts left-back Danny Grainger has been told that he will not be offered a new deal when his current contracts expires on 31 May. Grainger is out of action for up to nine months after sustaining a knee injury against Motherwell in November. Grainger's agent Tom Callaghan told BBC Scotland: "Danny was told earlier this week that he would not be offered a new deal at the end of the season. "Naturally, he was very disappointed, especially given his current injury." The player, a signing from St Johnstone, landed awkwardly at Fir Park and damaged the anterior cruciate ligament in his left knee. "He does, however, hope that the club will allow him to continue his rehab beyond the end of May," said Callaghan. 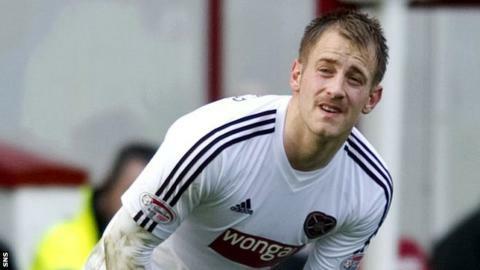 Grainger later tweeted: "Just to confirm, unfortunately I will be leaving Hearts in the summer. "Gutted is an understatement as I met some great guys and the club gave me the best day of my career. "Loved all the ups and downs and understand the clubs decision as it's hard times just now," he added. The Tynecastle club, who have suffered financial difficulties this season, recently sold Ryan McGowan, who can play at left-back, to Chinese club Shandong Luneng Taishan.